So I won’t be recommending or even reviewing in full until a new model is available. Results when cooking with this model were ok.
My JML was great when it worked but there were problems with the timer which does not like to be wound back. Then it impossible to get the cover fully off the bulb, when it needed replacing. The bulb did not pull out well and dislodged the wires so it was for the bin after about 2 years. I Agree with its very low rating and would not recommend this particular one. If you read in the instruction manual it explains if the timer is set and the food is ready before the timer goes of you just leave the timer to run down never try to wind it back. I have the JML Halo wave halogen oven and it has been fantastic. I bought halogen oven from jml but, after using it for a while the bulb blew up. I bought another one and the same thing happened. I called the customer service to find out what can be done, i was told to purchased bulb from them and fixed it myself. I couldn’t do it so both of them are now lying wasted. Do not buy a JML Halogen Oven. I have the older model. It is 15 mths old. I ordered a new bulb and it was extremely difficult to change you need an electrician or competent DIY er. It then stopped working after a couple of days and had to redo the fitting of the bulb. Now it has stopped working completely so have to throw it away after 15 mths!! No help from JML at all. They have now stopped making the bulbs!! I have a 2nd Halogen and bought Andrew James, so much better. No more JML products for me! I inherited my Dads JML halogen oven and loved it at first but it didn’t last long before the bulb went kaput, my Husband bought a new bulb and said he wasn’t about to change it as too awkward…and he’s been in engineering all of his adult life and frequently strips bike engines down so isn’t afraid of DIY. 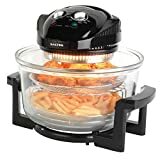 Yesterday I popped to Argos and purchased a ‘Cookworks’ digital halogen oven for £39.99 and it’s fabulous. Much better than the JML with being digital and also has the extender ring to increase its capacity to 17 litres so I’m thrilled to bits. Won’t purchase any JML tat in the future, I’m sticking with Argos knowing if it fails in a year, I can take it back for a refund or replacement and if it lasts longer than a year, I will be happy as it’ll work out to be a bargain. Thought I would share this. I bought a JML Halowave Aircooker Deluxe after seeing it on QVC. Sound naive but I was under the impression this was a new JML innovation. Did no research. Totally hooked by the advert. Looked wonderful so I ordered one. It blew the mains on its second use. So I looked online and found reviews such as yours revealing JML as the worst available. So I have ordered the third item on your list as I wanted the rotisserie. I am now in the process of trying to return the JML. I wish I knew what blew. It was not the bulb and I can’t take it apart to find out.